I also got two totally contrasting perspectives today. One reader wrote to tell me that she hated 'life is what you make it'. It left her depressed and she was unable to complete the book. Another wrote to me telling me that he was on the verge of suicide and the book saved his life because it gave him hope. One reader wrote saying that 34 bubblegums and candies is a book for 10 year olds and was an utter waste of money and another reader wrote saying that 34 bubblegums and candies was the most refreshing book she has ever read, it cheered her up, made her feel life was worth living after all and left a sweet after-taste in her mouth. "I must congratulate you once again, for your work portrays positive images of women despite the hardships, conflicts that they go through. Your portrayal of adolescence and young adulthood as a life stage is admirable. How a simple folly committed in youth changes the person's life entirely is something you have dealt in depth. You have somehow also sent a message to parents discreetly about the repercussions of their actions which can have a deep impact on the individual's psyche. Sorry, I can go on and on about your book, but you must be hard pressed for time." For me, what really counts is whether my writings manage to make an emotional connect with the reader. If the reader could feel everything that the protagonist underwent, I would consider it a great compliment. It is an honour to get your mails and even though I get hundreds, the joy is still the same. I take a while to reply (about 20-30 days on an average) as I have a huge back-log of mails. As much as I would like to reply promptly, it just cannot be done, as then I would have to make an alternate career as a e-mail writer , instead of writing books. 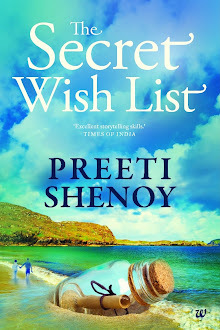 If you want to interact with me, and are in a hurry to get my response, the fastest way would be twitter (@preetishenoy is my twitter handle). The next best way to get a quick reply is Facebook wall of my author page. Leave me your guess in the comment box, and I shall update this post tomorrow with my answer. Sigh--all in a day's work. No I did NOT reply! :) I don't respond to threats. Had it been a polite request, i would have apologised and said I must have over-looked and would have replied. Of course I ignored it. I don't like rude demands. Proud to be your Fan!!!! 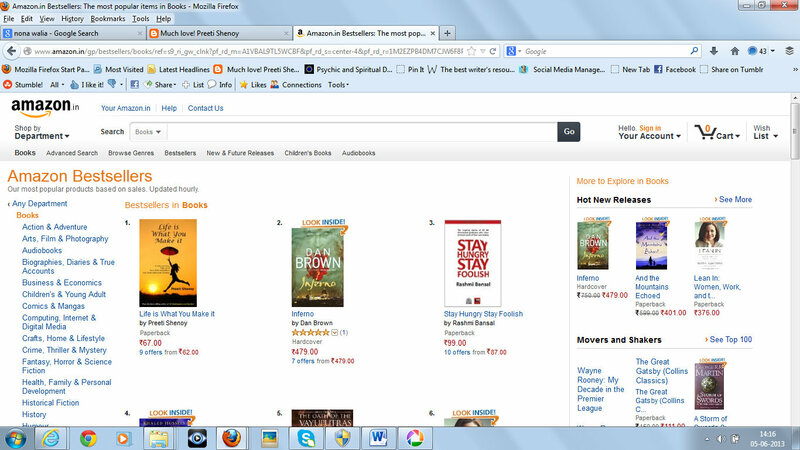 Let your next book reach 1st in the table!!!! haha... good idea bot what he did lol..i think u did..bt this cannot be encouraged ryt?? people should understand ur schedule.. keep going..try to be in touch with your fans preeti.. I think for every book there are going to be will like them or will hate them. so as an author all you have to do is keep writing because that is what you love to do! 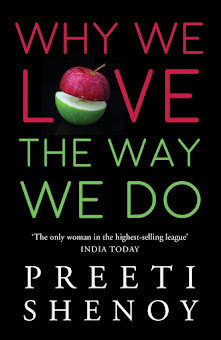 So keep writing...Hope to see many more books from you Preeti. You probably replied that you don't mind losing someone who forces you and is not polite ;) ? So happy for the Amazon rankings! Congrats ma'am!You deserved it. "Life is what you make it" is a must read for all.An excellent book worthy of praise ,love and appreciation from the core of my heart. what a coincidence......just half an hour before i completed "Life is what you make it".Thank you so much for the beautiful book......You know....i am really feeling rejuvenated. And on the tweet, I guess you did not reply .. So, its like 6 years (or is it 5?) and 4 books? You have done well. Congratulations on your success. Checking in after a really long time (years to be honest). You always did have a knack of connecting with your readers, so the comments/feedback despite their nature seem to be absolutely heartfelt. You must toast to that. As for the 'fan', well now that I know what you did (from the update) I must say there is perhaps no wrong way to deal with the situation, its all about perspective. Cheers, keep writing while I play catch up.